Hi! I’m Francine Queen, or Witnesstheabsurd on tumblr and Personfaces on twitter! 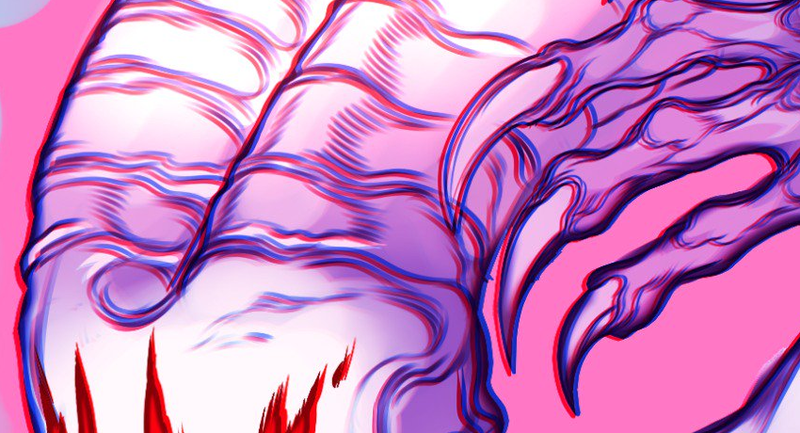 I was invited to produce a piece for Genderterror and couldn’t be more happy to contribute – the inherent beauty of “monstrosity” or the grotesque has been an intrinsic element of my work for the full span of my career and likely, always will be. A couple of years back I came up with an archetypal design that resonated w some of what I appreciated in both human and monster bodies – the “Jawboy” – impeccably sculpted muscles, long talons, and most importantly, a vats pair of eyeless, slavering jaws hiding kitchen knife fangs. I revisited a similar concept for the Genderterror piece, but this time opted to remove facial features entirely, instead focusing on a long coiling pair of horns. Crucially, the face is blank barring a series of bloody marks, potentially wounds, potentially self-inflicted- I wanted to create a character whose identity was self-created, whose identity might appear inexplicable or horrific to an onlooker – something that drew parallels with my own womanhood, being trans and queer. I hope you enjoy the work and i’m looking forwards to potentially appearing again here soon! I’m available to commission at witnesstheabsurd@hotmail.com, as well. Support Francine and other GenderTerror creators by becoming a part of our Patreon! Patrons can get work early, full res images, WIPs, and more!